Residents, there is a good news for you. 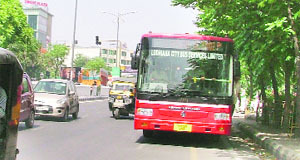 Ludhiana City Bus Service Ltd (LCBSL) has started plying buses on the Ferozepur road from today onwards. With this, those living in Sarabha Nagar, Gurdev Nagar, Bhai Randhir Singh Nagar, Aggar Nagar, Rajguru Nagar and others localities along the Ferozepur road could commute from one pace to another without bothering about traffic jams. In a major crackdown on punters, the Division No 3 police has booked personal assistant of Congress Councillor Sanjay Talwar and three others for allegedly betting on the ongoing Indian Premier League (IPL) matches. The Goraya police has succeeded in arresting a youth identified as Anil Kumar and two other friends of his-Karamjit Singh and Rajinder Kumar- after three days. All of them are residents of nearby village Mahal. They were arrested on the charges of brutally murdering Anil’s father-in-law Kuldip Chand in broad daylight on May 9. The city police has busted a gang of three members and recovered 14 kilograms of marijuana worth Rs 2.80 lakh from them. The building of the godowns situated in the premises of Punjab Food Supply Department situated near LRDAV College, Jagraon, has been proving a safe heaven for the drug addicts as well as other anti-social elements. To commemorate the birthday of Florence Nightingale, the founder of modern nursing profession faculty and students of college of nursing, DMC and Hospital celebrated International Nurses Day here today. Prem Kumar Gupta, secretary, DMC Managing Society were the chief gust on the occasion. As Urdu writer Saadat Hasan Manto's birth centenary celebrations are on, noted writer Kewal Dheer walks down the memory lane with his book "Manto Mera Dost" that was penned way back in 1962. The row between Dayanand Medical College and Hospital and its employees’ union seem to be getting murkier with every passing day with both the sides claiming to be right. The office bearers of Dayanand Medical College and the Hospital employees union claim that two of the employees were suspended after their elections on April 18, while the Dayanand Medical College and Hospital authorities claim they were suspended in January, much before the "union elections." On one hand students of government schools are expecting laptops, which was one of the promises of the Chief Minister Parkash Singh Badal before the State Assembly Elections on the other hand it is hard to the manage the government schools due to the shortage of staff. An annual function was organised at INIFD campus. The highlight of the evening was the most appreciated designer collection 'Infinity' by designer duo Manoj Kumar and Vinod Bhardwaj of Lakme Fashion Week. Ward number 13 is a mix of both East and West. It has well maintained colonies such as Sector 39 on the Chandigarh road and at the same time, it has areas like Hira Nagar, New Moti Nagar, Railway Colony and others, which houses a large number of migrant population. Sanitation is matter of concern to those residing in ward no 16 of the municipal corporation. Heaps of garbage and stagnant water on streets due to poor sewerage system can be seen on the Sherpur road, Sabzi Mandi and Fauji Mohala. Fauji Mohala is a hell in this ward. A disputed plot near the railway lines has been turned into a dumping ground. Area adjoining Fauji Mohala is still deprived of potable water. People are left with no option other than drinking contaminated water of hand pumps. Heaps of garbage lying in a vacant plot at Fauji Mohalla. Ludhiana: Firsteps School celebrated Mother's Day here on Saturday. Mothers had a day out with their children. Lots of fun-filled activities were organised in the school, where the mothers and the children participated together. Children with the help of their mother made photo frames and paste their photos, which were clicked and developed instantly there. Ludhiana: The Akdeniz University, Antalya (Turkey) has invited bhangra team from Guru Nanak Institute of Management and Technology (GNIMT) to participate in the 15th International Mediterranean Youth Festival to be held at Antalya (Turkey) from May 16 to 18. The team has been representing the PTU in North-Zone Intervarsity Youth Festivals and National Intervarsity Youth Festivals since 2006. The team has won one gold, one silver and two bronze medals in the North-Zone Intervarsity Youth Festivals. 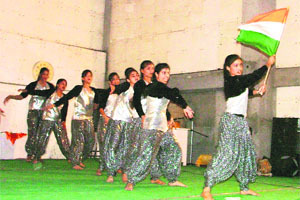 The team was declared as a National University Folk Dance (bhangra) Team for the last two years. The Team shall be leaving for Turkey on May 14. Ludhiana: On the first death anniversary on Nitin son of Amrit Pal, a state-level trade union leader from PAU Amrit Pal and his family members decided to celebrate the death anniversary of Nitin as a symbol of social awareness against road accidents and their root causes. For the purpose a lecture on 'road accidents and social dimensions' was organised on May 11 at Students Home Auditorium, PAU, Ludhiana. Two motorcycle-borne persons were killed when a speeding truck hit them from behind near Bhadla Neecha village last night. The deceased were identified as Ajaib Singh and Bhagant Singh, both residents of Alipur village. The house of Amarjit Singh, an NRI, at Dalla village was reportedly burgled last night. Burglars took away Rs 20,000 cash, four tolas of gold ornaments, three wristwatches and two mobile phones. The police has registered a case. Thanks to a triple ton by M Zuhaib (325), Sangrur hoisted a huge total of 573 runs in their first innings against Ludhiana in the qualifying round match in the Punjab State Inter-District Cricket Tournament (U-16) for the ML Markan Trophy being played at Punjab Agricultural University campus ground here today. Tania Munjal, a student of DAV Public School, hogged limelight after clinching two titles on the second day of the Open Varinder Memorial Table Tennis Tournament being organised by the Varinder Cultural Society and Maverick at the Punjab Agricultural University campus here today. Trials to select cricket probables (U-22) will be held here at Arya College ground on May 14 at 3.45 pm, according to Vinod Chitkara, general secretary, Ludhiana District Cricket Association (LDCA).